I have recently found myself frequently needing to count the number of words in a simple ASCII text file as I create it. Unfortunately, the Vi editor does not provide this by default. Why not? Continuously maintaining a count of words can require a surprising amount of work as a file is rapidly modified through the sweeping methods possible within Vi. That's fine, it's easy to add the capability. Let's see what we want to accomplish by using the creation of this file as an example. First, notice that the buffer content has been color-coded for syntax specific to the automatically detected language content. Second, notice the detailed statusline at the bottom. It starts with the full path to the file being edited. The appended flag ,+ indicates that the file has been modified since it was last written. Press :w to write out the buffer and that flag disappears. The following [xhtml] indicates that vim has automatically determined that the file contains XHTML data. You can see that this is not assumed from the file name, as it ends with .html and not .xhtml. Then we're told that the buffer currently contains 1202 words, and the cursor is on line 43 out of 286, 15% of the way through the file. This looks useful! That's a lot of detail on the line, and there is very little free space remaining. That's fine, this has been set up so that the long full path to the file will be truncated at its left end as needed to otherwise allow everything to fit. I show how to do that below, it's simple. To get started, use vim, not vi. 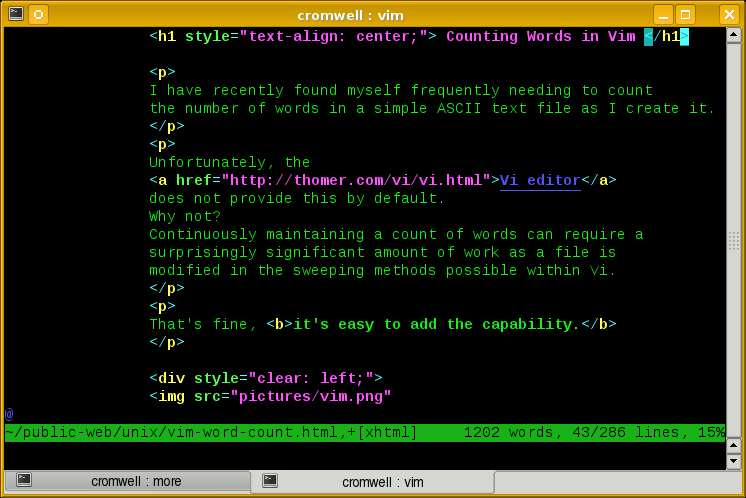 With Linux and OS X, you get vim by default, and typing vi really gives you vim. But with OpenBSD, Solaris and other versions of Unix, you may have to add a package and explicitly run the vim command to get the modernized version. The easiest way to explain this is to simply show my .vimrc file with plenty of comments. It starts with the basic settings, then it defines a function for efficient word counting and builds a complex statusline. Then there is some standard boilerplate provided with the distribution for handling compressed files.
" Turn on syntax highlighting, or really color coding.
" This really helps you spot broken syntax as you type.
" undoing all previous changes in reverse order.
" Multi-level undo is NOT helpful for most people!
" Some option activate by default (remove the no to allow these).
" Some environments set textwidth to force linewrap. Disable this.
" Here begins my automated wordcount addition.
" Update the count when cursor is idle in command or insert mode.
" Update when idle for 1000 msec (default is 4000 msec).
" Below here is just  standard content from Mageia installation environment.
" To display color on a vanilla xterm (Use Rxvt luke).
" For *.c and *.h files set formatting of comments and set C-indenting on.
" For other files switch it off.
" Don't change the order, it's important that the line with * comes first. for background colors! Without the '*' the bold attribute is removed. a number instead of a color name. The case of the color names is ignored. is 12, DarkGray is 8 etc.